There’s a good reason this is one of the most popular recipes on our site…it’s fantastic! 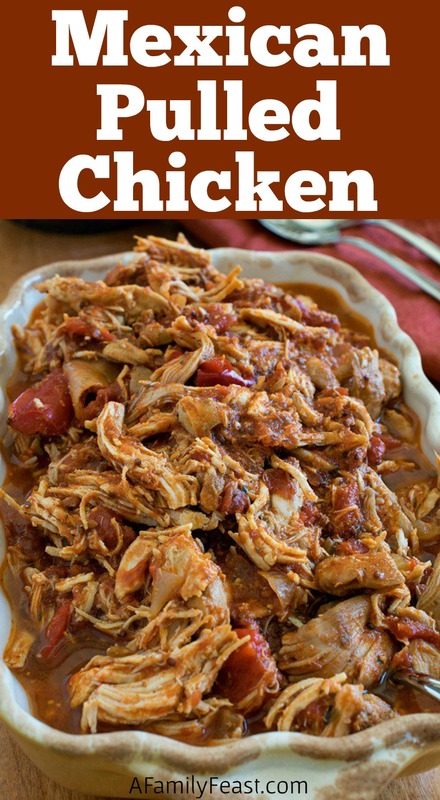 Mexican Pulled Chicken is easy to make, super flavorful and the basis for so many delicious meals! 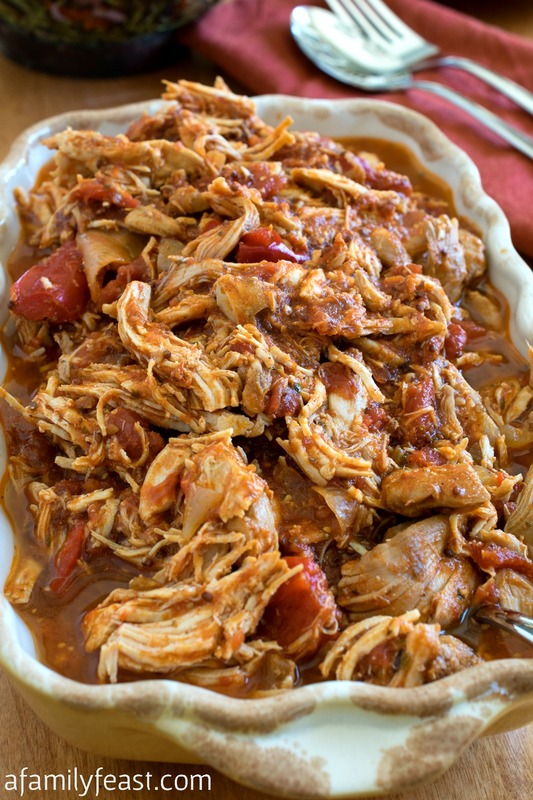 Jack recently prepared a wonderful Mexican-themed dinner for us, and this Mexican Pulled Chicken recipe played a starring role in several of the dishes he made. This chicken is perfectly flavored with a spicy blend of tomatoes and peppers as well as other seasonings. It’s cooked in the oven until fork-tender, then shredded. Scroll down to the recipe card below to watch a video to see how it’s made. 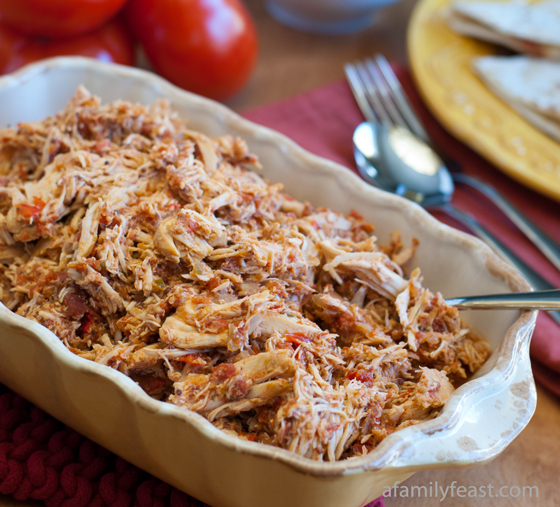 A good Mexican pulled chicken is a great recipe to have in your go-to recipe collection! It can be eaten as-is or as part of a sandwich, or it can be used in many other recipes! In fact, several of our other very popular recipes here on A Family Feast use this recipe including our enchiladas, Mexican lasagna, and our chicken chimichangas! The key is to use a mix of white and dark meat in this recipe (we used a combination of boneless chicken thighs and breasts) – because the thigh meat lends so much more flavor and juiciness to the finished dish than using the breast meat alone. 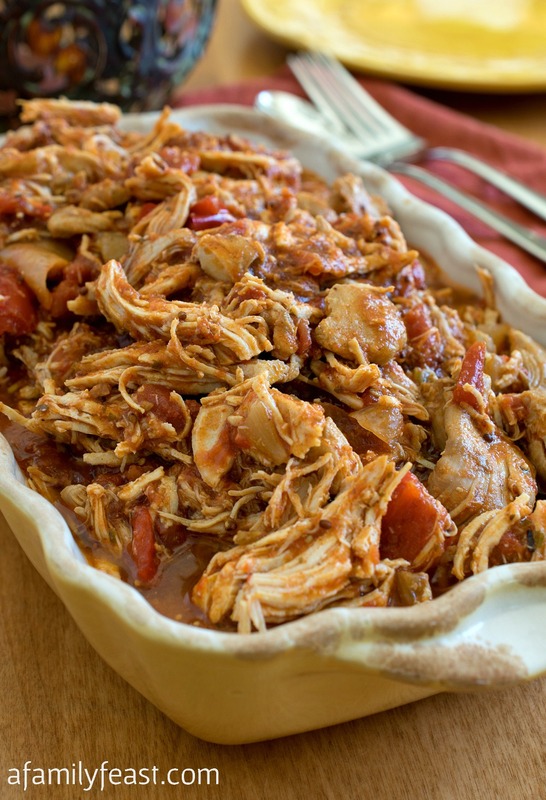 Since originally posting this recipe back in February 2013, this Mexican Pulled Chicken has become one of our most popular recipes of all time. We’ve updated the photos and created a video (scroll down below to watch it) since our original post. 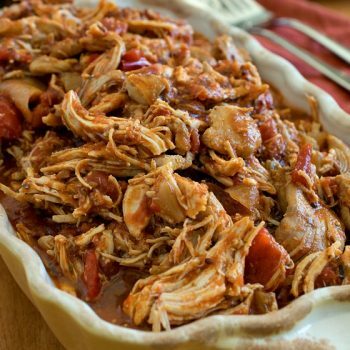 One last note: Over the years, we’ve been asked if this Mexican Pulled Chicken recipe can be made in the slow cooker. The answer is YES! While we haven’t cooked it in the slow cooker ourselves, several of our readers have posted in the comment section below that they saw great results making this recipe in their crock pot. Enjoy! Remove the pan from oven and peel off parchment paper and foil. Place chicken on a cutting board and shred with two forks. I LOVE your site!!!! I am having a house warming and will be using several of your recipes. I am wondering if The ground beef tacos ( x3) , the Mexican Beef shredded (x3) , and the pulled chicken ( x2) would be enough meat to feed around 50 individual. Thanks SOOOOO much for your opinion. 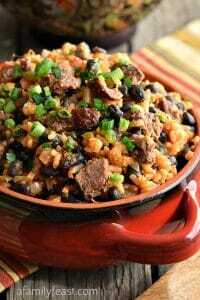 I also plan on making the mexican rice ( x3) ( Not sure if I triple it if it will be enough? ) OK I all stop rambling and I appreciate any advice!!!! Thanks soooo much! This is a HUGE help for us. Have a great day!! Oh I also plan to have dessert ( store bought cake) and chips and salsa/guacamole. Because I was slightly off with the meat. I wonder if the toppings are a little off as well. Please take your time with getting back to me. When you do have time can you ask Jack about some of the following. Taco Sauce: 3 bottles ? Hi Natasha – Below are Jack’s recommendations and other thoughts for quantities! Have a great party! If you are assembling and serving, you can control the amount of food used and gauge as you serve. If this is self-service, you need to have food in reserve. Some people really like loading up tacos. (Tomatoes: 10) That may need to be bumped up a bit. I would go with 15. (Onion: 4-5) Assuming these are large onions that seems OK too. People tend to shy away from onions in mixed company. (Cheese: 4-5 Lbs) 5 pounds is only about an ounce and a half per person. If this is self-service, may want to bump this up a bit. (Taco Sauce: 3 bottles ?) Assuming they are 12 ounce bottles, that is a little more than a half ounce per person…should be OK. Thanks Natasha!! Can’t wait to see the photo!! Made this tonight and used it for Buritos. A big hit! It makes a lot but i don’t think the leftovers will last long. Glad you enjoyed the recipe! We have lots of recipes on our site using this chicken – so if you need inspiration for the leftovers, be sure to search our site for pulled chicken recipes! What us a good sub for the Agave here? I cannot wait to make this. Thank you! Hi Stephanie – you can substitute honey. Hope you enjoy the recipe! Not sure what you pour over the chicken at the end, the vegetables or the strained liquid? Hi – Sorry for the confusion. You want to strain out the excess liquid so after you’d done that, you’d put the chicken and vegetables back in (not the liquid). Thanks for writing to us – let us know if you have any other questions! Hi Martha! 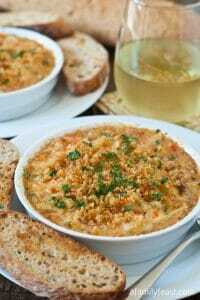 I’ve made this recipe multiple times now, each time it has been delicious!! I have always wanted to make chicken that taste as good as you get in a real Mexican restaurant, and this tastes even better! The last time I made it, I used the left over meat to make individual quesadillas and burritos and froze them. They’re quick and easy for lunches and taste just as good as the first day! Much less expensive and healthier than buying something prepackaged from the grocery store! Any idea on nutritional facts for this recipe?? Thanks! Hi Monica – We’re glad you are enjoying the recipe as much as we do! I haven’t calculated the nutritional information for this recipe – but MyFitnessPal had a great recipe calculator tool: http://www.myfitnesspal.com/recipe/calculator. Hope that helps! Hello BJ and thank you for taking the time to write to us with your concerns! The first time I saw my husband Jack use plastic wrap under the foil in a recipe like this, I thought he was crazy and feared that the plastic would melt from the heat of the oven. But done correctly – with the plastic pulled taut over the pan and edges completely covered by the foil – the plastic shouldn’t melt and it is very effective in preventing the foil from disintegrating from the acid of the tomatoes in dishes like this, as well as creating a seal that prevents the moisture from escaping. This is a technique that has been (and still is) used in many commercial kitchens on a regular basis. Having said that, we certainly hear your concerns about plastic chemicals – and we have had a few other comments from other readers as well who either don’t feel comfortable with using plastic wrap in this manner, or perhaps didn’t correctly cover the plastic with the foil and had issues. We have updated this recipe to suggest using parchment paper instead to avoid any further concerns. I was just wondering if this recipe is just as good done ahead of time and reheated or made in the slow cooker? Hi Samantha – It can definitely be cooked ahead of time and reheated. I believe in the comments here on the post, we did have one reader who made this in the slow-cooker rather than the oven. Other than needing to drain off a bit more of the liquid at the end, it seemed to work well in a slow cooker! Hope that helps! Love your recipes and can’t tell you how much our family loves anything Mexican. Thank you so much Barb!! Happy New Year! Just a question on this, does the whole grain mustard refer to whole mustard seeds? Sounds silly, but I just want to clarify it so I’m not putting the wrong thing in! Hi Mattie – Not silly at all! 🙂 Yes – look for the mustard that has the whole mustard seeds in it for this recipe! Hope you enjoy the dish! Martha, thank you so much for taking the time to share this wonderful recipe. I made the mexican chicken yesterday and it was amazing. I made chimichangas and the chicken with a little pepperjack cheese was all that was needed to make them an instant hit with my husband. This recipe will definitely become a regular in our home. Thank you again! I tried this recipe for the enchiladas recipe on your site and it was awesome, actually i’m about to make it again. Hopefully I can stop “tasting” the chicken before I stuff it in the enchiladas this time, lol, it is soooo good. Thanks Jennifer – so glad you enjoyed the recipe! Are you sure I can put the plastic wrap under the foil in a heated oven???? They didn’t even both to remove the “family feast.com ” logo at the bottom. If these folks aren’t you you may wish to speak with them! Thank you so much Steve! I’ll be dropping them a note right now! I appreciate you letting us know! Thanks – and if you try the recipe – I hope you enjoy it! This is in the oven right now, house smells wonderful…. 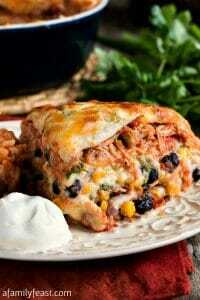 I am preparing to make a loaded baked potato an Mexican Pulled Chicken casserole. Hope you enjoy the recipe Mark! Thanks for visiting our site! Thank you for sharing this recipe. I love Mexican food and love trying new recipes. This will be added to my list of ones to try. Looks like a great recipe for the crockpot, too! Just made this last night in the crockpot and it turned out amazing! There was a lot more liquid that I had to drain off than I thought there would be but after I shredded the chicken I put it back on and let it simmer in the sauce for and other 30 min. Definitely crock pot friendly. Thanks for letting us know that it works in the crockpot too Kari! We’re glad you enjoyed the recipe! How long would you cook this in a crockpot? Hi Tara – We’ve only made it as written, but I just browsed through some of the earlier comments and it looks like someone made this in the slow cooker and for her, it took 3/5 hours. Hope that helps! Awesome! I just threw everything in my crockpot and have high hopes! You sold me at “Mexican”! Mexican’s a huge winner in my house (in fact, we had carnitas tacos tonight!) and we’re always looking for fun recipes. This one’s a keeper! Thanks for stopping by Julia! Hope you enjoy the recipe!